Re-painting interiors can pose several potential risks, especially when working at heights with difficult ceiling angles. 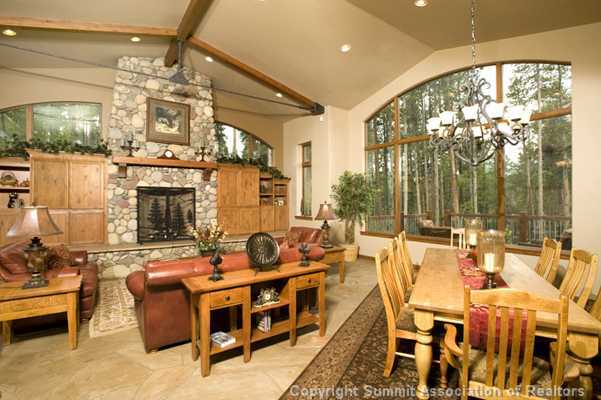 This residence in Breckenridge Colorado allowed us to focus on safety and accesibility to the surfaces that needed painting. Before starting a job we review all safety issues and assure that our equipment is adequate to reach surfaces safely. 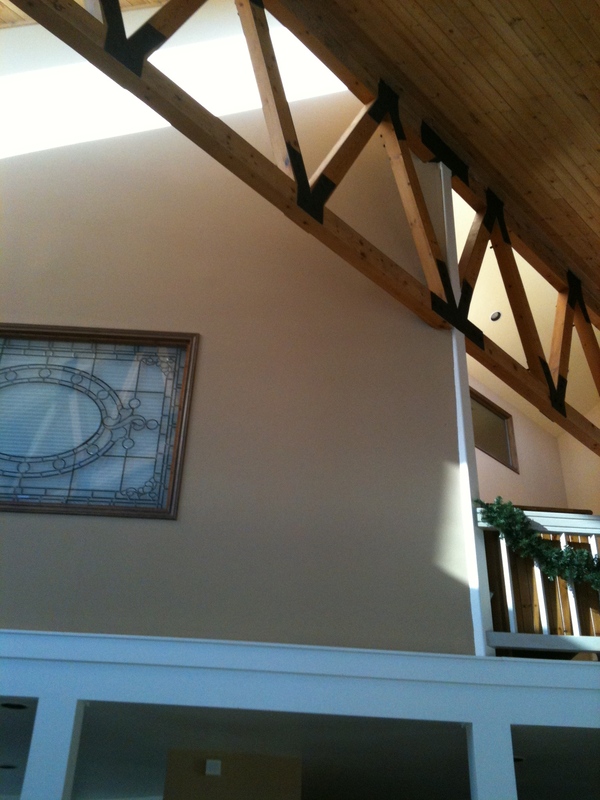 We used a 40 ft. ladder with safety stabilizers to access the walls above this tounge and groove ceiling and joists. A worker was spotting our climber at all times and assuring the footing of the ladder remained stable. We also used a double sided sticky product to keep the ladder feet from moving or sliding. We take extra precautions to assure safety at all times. We are proud of our safety record. Is Darkening the tone or shade of wood without stripping down to bare wood possible? Yes it is. There are many methods to go about this process. When consulting with clients there are two essential factors. 1. How much wood needs a color change? 2. What is the severity of color change? Preperation Steps – Always cover floors, furniture and areas around work area. Ventilate area as we are working with solvent based materials and use fans as needed. Follow all label safety instructions. Always store solvent based rags in a tightly closed water container – they can easily combust. 1) Wash all wood with a TSP solution, xylene or a strong solvent cleaner. We tend to use xylene as it seems to be the most effective means to removing human oils, waxes from cleaning and dirt and debris. Sometimes a mild scour pad helps. 2) Scuff Wood with a 220 grit sandpaper always with the grain, not against. and wipe clean with mineral spirits and allow to dry for a few minutes. 3) Look for Damaged Wood and areas where the finish is gone or the wood has changed color. Even minor nicks and dings need attention here. These areas will need to be cleaned with a wood brightener, sanded and cleaned to remove all oxidized and water damaged wood. 4) These areas need to be sealed with a sanding sealer, clear shellac or polyurethane. Which ever product was used previously is best to assure adhesion. If wood is very damaged further steps may need to be taken. Staining – Have rags , mineral spirits, a water bucket for the used rags and an empty cut bucket near by to place your brush in when working with the stain. 1) Practice – Using a very nice and soft ox hair brush or a china bristle brush is essential. Apply the gel stain in sections, while wiping adjacent areas with a clean rag. Keep in mind, the more coats applied the darker this material becomes. Work slowly and keep in mind lighter is better than darker as additional coats can be added. Let your sample/practice piece dry as to see the true final color. It is best to practice on something with the same type of millwork, corners, adjacent edges, ect. Practice some more and do not over apply. Practice some more. Wash brush very well with spirits changing the spirits three times during washing. After ample practicing…it’s time to start. If you are feeling nervous practice more. Techniques – My favorite brush to use is a slightly worn out, very soft and very clean natural ox hair brush. A brush no more than 2 inches. A few different widths of brushes are nice to have handy. Let’s say we are staining a handrail from a golden oak to a light oak (yellow/orange to a light brown). All prep work and masking are complete. I’ll start on the left rail going up the stair well ( don’t choose too large of a section as the stain can start to dry and get tacky). Apply stain in strategic sections and at the praticed amount of stain to get the desired color. 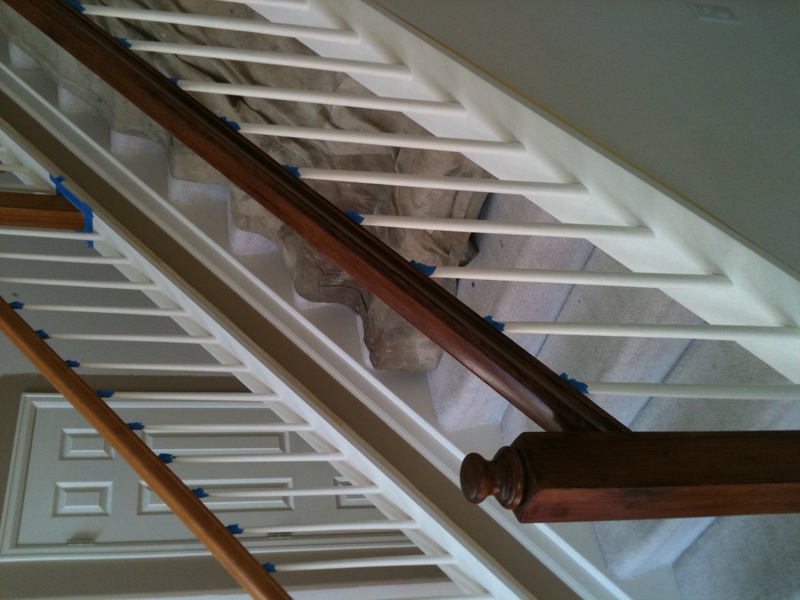 Applying less stain where sections meet (baluster meets rail). I will wipe the brush almost dry after applying the stain to the wood section. Work the stain with the grain using your clean brush. You may need to re-clean the rag, as it picks up additional stain (did you practice?) Keep in mind lighter is better than darker. When moving on to the next section, choose a section where the stain is dry at the adjacent areas. Gel stain is intended for use on making wood millwork and decorative sections stand out darker than the flat surfaces. The outcome is very nice with an old world, distressed and aged look. Gel stain can also be used on larger surfaces at smaller quantities to slightly darken a tone or hue of wood. Many cabinet finishers and glazers will also use gel stain as a way to very subtly darken the deep grains only. This is accomplished by brushing the gel stain across the grain and removing completely with a rag. It is a very finite detail high end cabinet finishes. Gel stain can also be used as described above to give a full change in color. This is NOT SUGGESTED on very large areas or on a large volume of wood as it can be too tedious and come out looking brushed and faux like. Unless this is what you are looking for, there are additional options to re-finishing wood to a darker color (see fogging below). A full change in color can take multiple coats brushed out miticulously. It takes a detailed and experienced eye and hand to complete a set of cabinets, stair rail or a door to a good finish. To Darken larger areas – See the Fogging Wood blog. An advanced spray technique designed for experienced finishers.